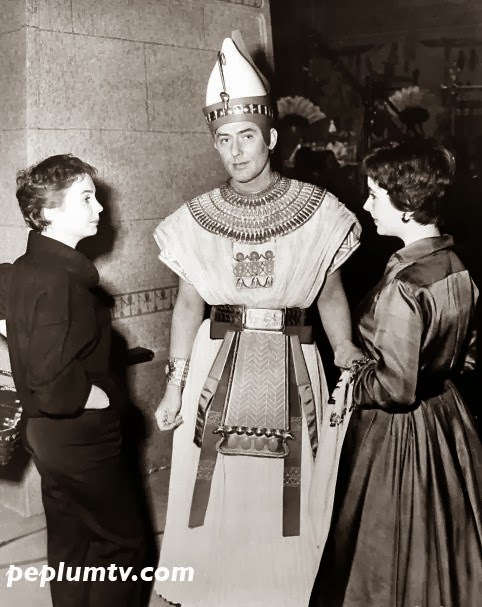 Elizabeth Taylor visits the set of THE EGYPTIAN with Michael Wilding in costume and Jean Simmons out of costume. Liz was married to Michael at the time so the wife visited the husband's set. It's more interesting to see Jean and Liz together. The two actresses often worked in (and competed for?) movies with the same type of roles. I wonder if they were friends. Fascinating photo and interesting comment on Elizabeth and Jean. They were both similar types, and their husbands were friends too - Stewart Granger and Michael Wilding who had began in the British cinema of the 1940s. In fact one of the Hollywood gossip columnists - either Hedda Hopper or Louella Parsons - famously insinuated they were more than friends which led to a showdown between Granger and whichever one it was. I would imagine the foursome were all pals and must have mixed socially. Simmons was also great friends with Deborah Kerr, they were in 3 films together, and Kerr of course also made several flicks with Granger. As Brits in Hollywood they must have hung out a lot together.